The Pleasant Hearth Ascot Fireplace Door is a cosmetic bi-fold style door which is compatible with and enhances a traditional masonry fireplace hearth. It has a powder-coated, high-heat, midnight black finish and a one-piece welded frame construction. It’s designed as a surface mount that sits outside the fireplace hearth and opens against a flat surface. Fireplace glass doors aid in minimizing heat loss and cool air loss up the chimney by up to 90 percent, when the fireplace is not in use. This cumulatively adds up to substantial energy savings yearly for the consumer. 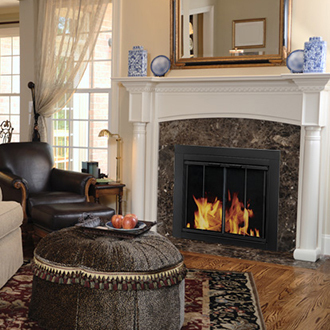 Pleasant Hearth Ascot fireplace doors are solely built for masonry fireplaces and not pre-fabricated ones. When the fire is burning in the fireplace, the glass doors should be kept open while the mesh panels are closed. When you’re not enjoying a fire, simply close the clear tempered glass doors to reduce heat and cool air loss. Sizing Guide | Check the prices! | Read the Amazon reviews! Midnight Black finish: This premium black finish ensures that your fireplace room looks fantastic, it’s sure to impress your friends when you invite them around. Clear tempered safety glass: Safety is very important when it comes to fires and the high-quality materials used ensures safety. Able to fit different fireplace hearth sizes. Proudly made in the United States of America: Not many products are made in the US these days, so support the ones that do! 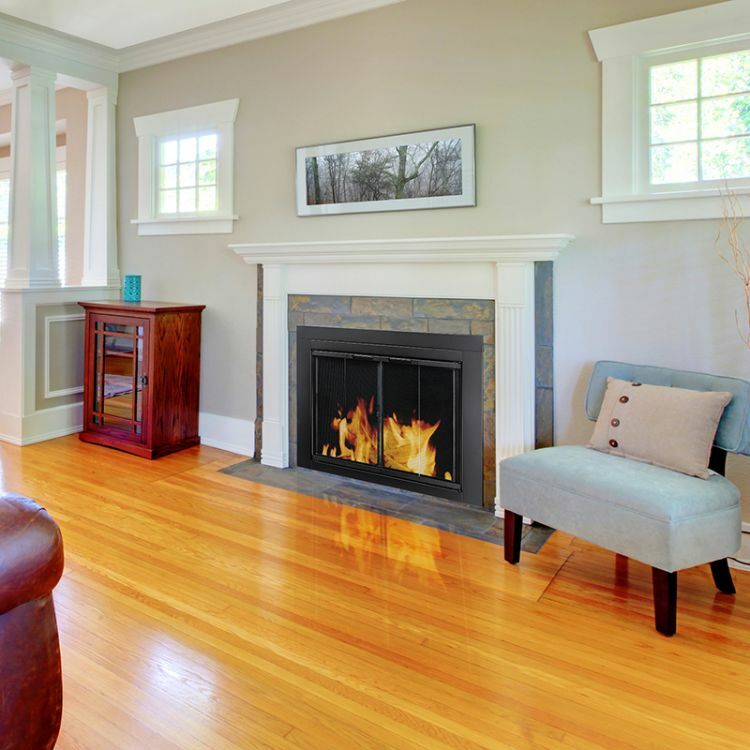 It’s imperative that you perform measurements of the inside width and inside height of your fireplace before acquiring the Ascot, Pleasant Hearth fireplace door. The measurements need to be accurate to the nearest eighth. Does it come with heat insulation? No, they aren’t airtight at all. Why are the fireplace suited only for masonry fireplaces and not pre-fabricated fireplaces? Masonry fireplaces have a steel lintel at the top of their opening where the Ascot fireplace glass doors are mounted. This part of the masonry fireplace doesn’t exist in the pre-fabricated ones making these doors virtually unsuitable. Are the mesh panels removable? Yes, they are. The mesh panels act as screen doors, and they open on hinges. These hinges are attached by pins. When these pins are removed, the mesh panels will come out. It would still work for the fireplace as long as the top of the opening is straight and not curved. Also, the opening size must be compatible with the unit you get. Aesthetically very classy and beautiful. Quite easy to install. It’s a do-it-yourself installation. 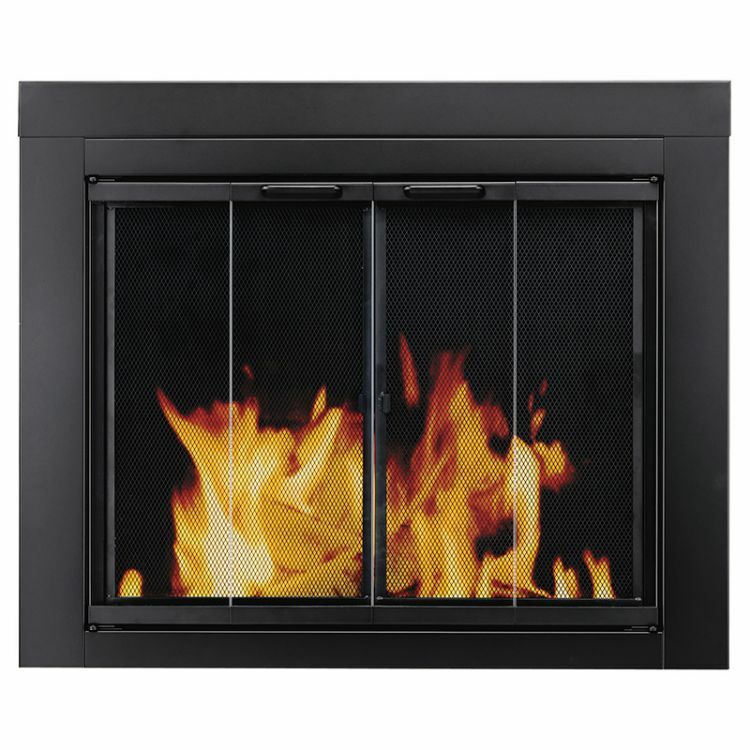 Minimizes heat and cool air loss by up to 90 percent when the fireplace is not in use. The sturdy standard mesh panels safely contain the sparks from the fireplace. The track-free bi-fold doors open entirely to give you a full view of your fireplace. 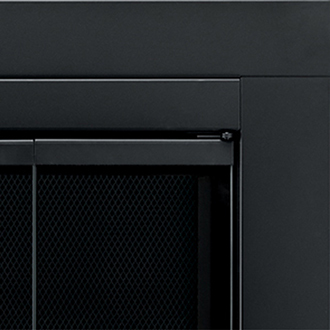 The Ascot doors can’t be installed on pre-fabricated fireplaces. The doors aren’t 100% airtight, so you can’t completely block the smell of smoke, but hey, who doesn’t like a slight smell of a fireplace burning. The Ascot model door is a great quality and beautiful fireplace door, with its stylish single tone midnight black finish it’ll make your fireplace pop. It’s rather easy to install and will provide you with significant energy savings.